I had a couple of people asking me how I had done the bases for my Grymn Troops so I thought I'd share the sequence, materials and suppliers here. I haven't taken WIP shots as I'm pretty sure anyone reading this knows how to spread PVA on a base and dip it in stuff!?!! All the troops are mounted on Laser-Cut plywood bases from the wonderul Fenris Games (ebay shop). These plywood bases are 1.8mm thick. I wanted to use the thinnest base I could as the Grenadier Miniatures have fairly thick integral bases so i didn't want every figure to look like it was sat on a hillock! The bases are dead flat and extremely accurate, (in my experience thin plywood is much less likely to warp than the equivalent to MDF and is tougher and more resistant to wear on the edges and corners) couple that to the friendly and lightning fast service and Ian (Geronimo Jones) at Fenris gets my whole hearted approval. The bases are coated on both sides with dilute PVA glue to further prevent warping and to stop any moisture penetration. The miniature is superglued to the base and the edges built up with your favourite modelling putty. The upper surface of the bases are treated in a similar way to the bases of my Grymn troops to create a rocky winter look. All of the materials I used to decorate the bases come from Antenociti's Workshop. Diluted PVA is spread and Antenociti's fine talus (408) applied to around half the base area and allowed to dry. Then course talus (410) applied similarly in smaller patches. The base then receives a thinned coat of Foundry Granite 31b followed by dry brushed highlights of Granite 31c and (lightly) Canvas 8c. Once dry the snow is applied. This is a mix of Antenociti's own AW Snow Powder, diluted PVA glue and white paint. 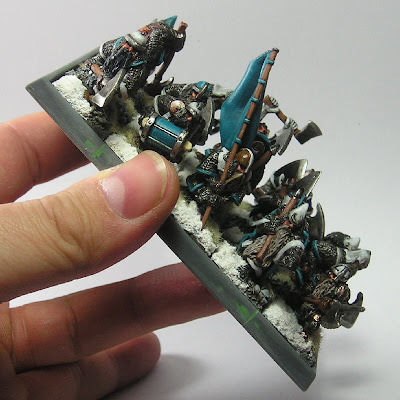 Jez over at Antenociti's recommends mixing in the white paint to this powder so you get a more opaque look, I didn't do this on my Grymn figures, and I think the snow on them looks too translucent. The resulting paste is then smeared/dolloped onto the un-talos'd areas of the bases with a brush and allowed to dry. The final element to the bases is the application of a little of Antenociti's own Winter Static Grass, with dilute PVA. The underside of the base has magnetic sheeting applied curtesy of Tiny Tin Troops, another superb on line retailer who seems to break the speed of light in their shipping service - again recommended. Steel sheet (again from Tiny Tin Troops) is adhered to the movement tray. The movement tray is one of the Modular ones from Games Workshop, although I bought these from Maelstrom Games a discount online retailer. This is probably the most useful thing that GW has produced in the last few years - I picked up half a dozen sets and will have all the Dwarf and Orc units equipped with the relevant sized trays. I made 20 trays in justa couple of hours sat in front of the TV the other night. The only issue in assembling them is needing to fill the joins between the corner pieces and the sides; here I've used Squadron Green putty and sanded lightly. Overall this took me a couple of hours to do the 15 bases here, although that was spread over a few evenings of modelling and painting - normally while waiting for something else to dry! Now all I have to do is figure out how to make a snow and rock board to game on. Oh Man, those look awesome! Where did you get those golden age D&D minis?!? I used to have those guys in high school back in my 1st Edition D&D game days. Wow! That takes me back. Any idea where I can get some of those? Hi Hammer. They aren't D&D minis, they are Grenadier from their Fantasy warrior range. Click on Grenadier in the title bar and you'll see all the associated posts. Mostly i got these from ebay, although they are still produced by mirliton in US and em4 miniatures in the UK... links in my recommended links list - glad you like them ! Brandlin. 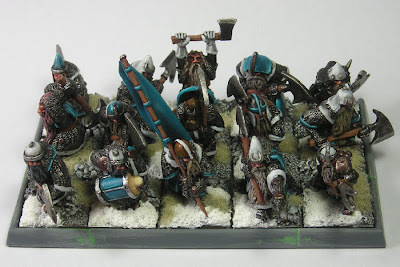 Alan, I posted a photo comparing a Grenadier FW dwarf to Vendel Miniatures dwarves. I thought you might be interested. Mr Tufnel - thanks for the encouraging words, much apreciated. Andrew - Thanks for the pictures. Looks like the vendel dwarfs are compatible size-wise (height and bulk) but they do have a very different look; almost cartoony in comparison. As I have over a thousand dwarfs to paint, I doubt I shall be splashing out on any more any time soon. 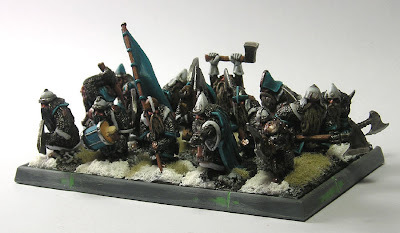 But if I ever get to the bottom of the lead pile, then I shall have another look at the Vendel dwarfs.